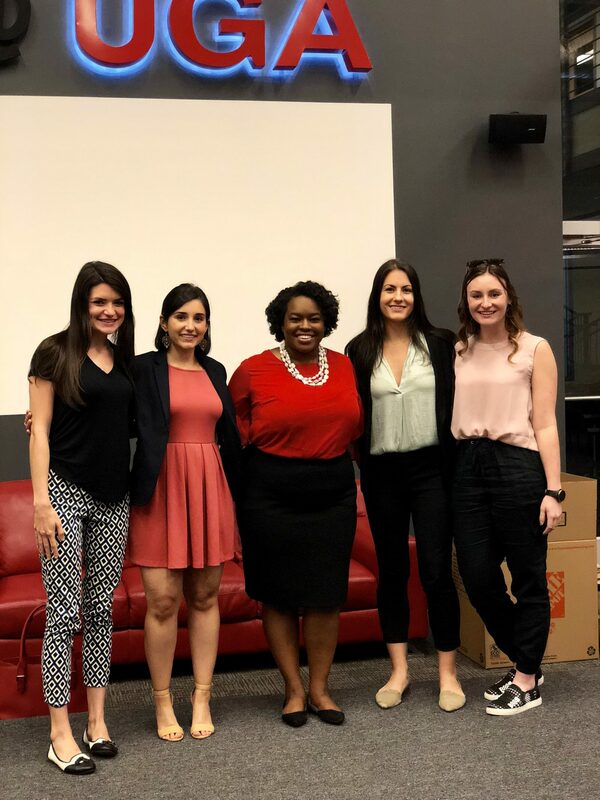 PRSSA took a look at non-profit PR last night, and members were excited to gain some insight from Ms. Ayana Isles. Ms. Isles graduated from Grady’s public relations program in 2015 and now works as an Associate Public Relations Coordinator for Children’s Healthcare of Atlanta (CHOA). CHOA is comprised of three hospitals: Egleston, Scottish Rite and Hughes Spalding. They are ranked among the top children’s hospitals in the country and are the largest healthcare provider for children in Georgia. Ms. Isles began by emphasizing the mission of Children’s, and the importance of the mission to everyone on the team. CHOA’s mission reads: “Dedicated to making kids better today and healthier tomorrow.” Having this unifying mission is what makes non-profit PR special to her. Ms. Isles stressed that when her team has a story they want to tell, they get more pickup from media outlets because these outlets believe in the mission too, along with the PR team, the doctors, the patients, the families… everyone. Ayana continued her conversation with what, specifically, the PR team does. Not to our surprise, “it changes everyday.” Some responsibilities of the team include building media relations with journalists at the local and national levels, filling out media consent forms to ensure patients’ rights are protected, and writing patient stories. Telling these stories makes up a large percentage of her work, and “having those tough conversations and being trusted with that information is an honor and a big job, to raise awareness not only for the hospital but for the illnesses as well.” The PR team also manages brand campaigns and works across the board with social media and graphic designers; being collaborative is a major key to success in her role. Finally, they are stewards of the brand. Everyone on the PR team should want to represent CHOA in the best light, which comes to play in every aspect of what they do and the content that they produce. Next, we explored the three main drivers of Children’s media relations. First and foremost is to drive fundraising. The PR team is always looking for new ways to incorporate fundraising to expand the hospital, launch research, etc. Second is to be a trusted source. This becomes important when pediatric issues arise, that CHOA is the expert voice. One example Ms. Isles gave was that this year was a tough flu season, so her team strategized to position Children’s as a trustworthy source on the matter. The final driver is to increase awareness. This can be about an illness and how others can help, or increasing awareness about the brand in general. Ms. Isles concluded with some words of wisdom for us. Perfect your writing skills. The writing test is the number one thing CHOA looks at. The writing should have a good hook, be well thought out, and be concise, yet informative. Build and maintain relationships. It really is about who you know in this industry. Keep up with your professors, mentors, fellow interns and classmates. Take pride in your experience, even coursework. Employers don’t expect you to have hung the moon, so don’t downplay your classes, leadership roles and involvement. They are looking to see what you’ve learned. Take on leadership roles. It shows that you are a committed leader, which is something everyone wants to see in this industry. Work on interview skills. Be conversational, be personable, and be yourself. They are looking to see your personality, to tell if you would fit in well with the work and office culture. Also, ask questions! It shows that you are engaged, have done your research, and care. Thanks again to Ayana Isles for the wonderful insight last night! It was a treat to hear from a recent graduate about her experiences out in the “real world.” Join us for our next meeting on April 17 for our Executive Board Elections!